Want to excite that drab office? Got a couple of car seats laying around?! 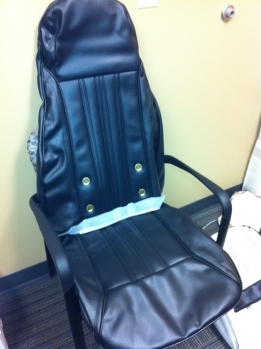 You can only change that computer desktop wallpaper so much and so often – so take it to the next level and make some car seat office chairs! 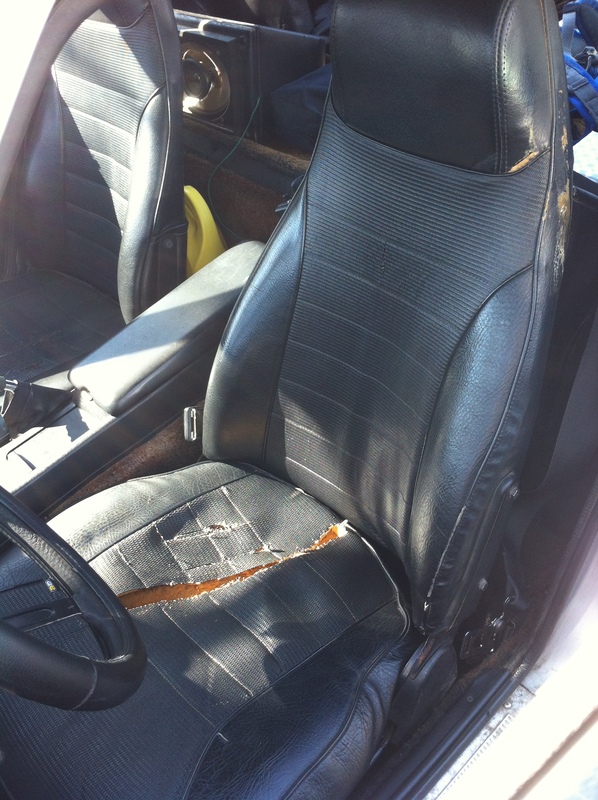 Back in March of last year, I got new seat covers in for the 280z and just had to throw them over the office chair for fun. 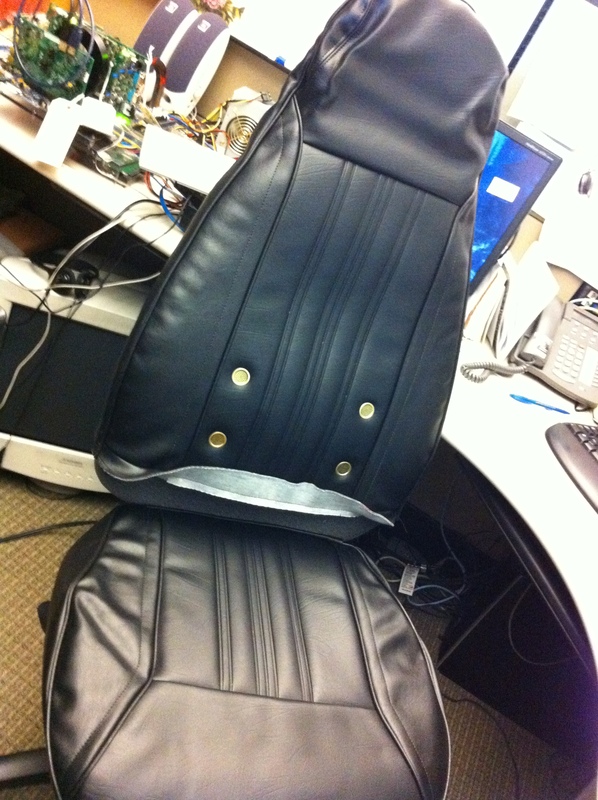 Well it looks the guy at DIY-Create actually brought it to fruition on Instructables using the actual seat! Seats came from a junked 240z, and I’d say, they’re now getting much more use than left in a yard. Also, you can bring that car you love so much into the home. Enjoy! 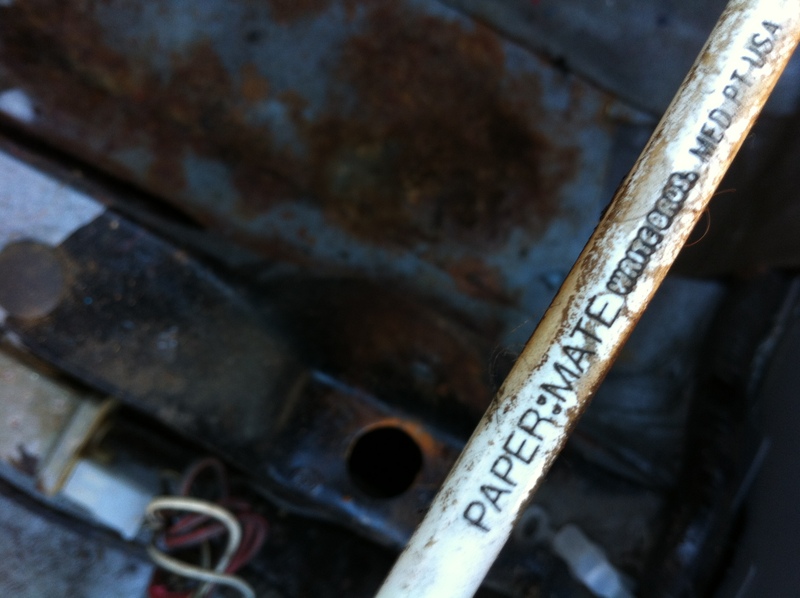 And many thanks to DIY-Create for using the seat restore article and mentioning Daily Datsun as a resource! Since that day (about a month ago) i’ve been planning, scoping, and wrenching on the 280z to get it ready for game day. With little over three weeks away, it seems like it’s got a great distance before it gets to 100%. This morning, it was back to the seats. 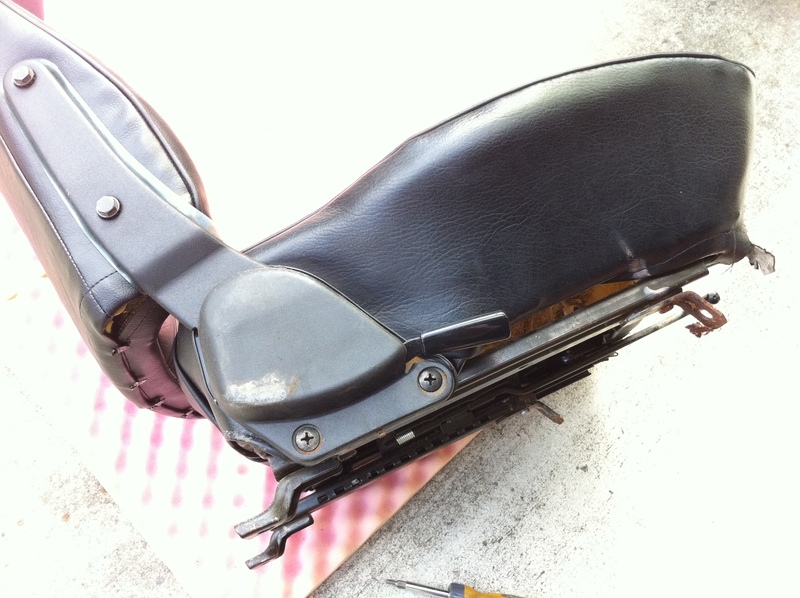 Last time, I had just recovered the seat backs leaving the seat bottoms to be finished. 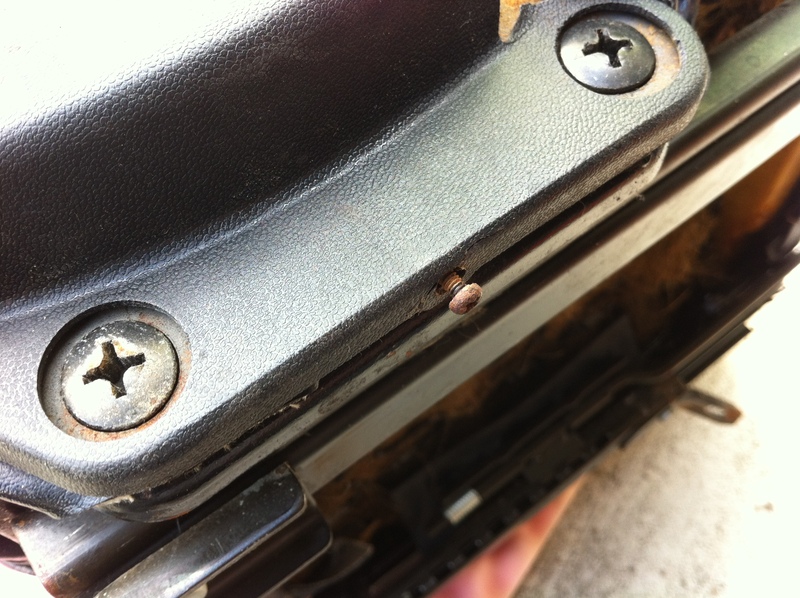 There are three small screws that hold in the cover plate to the adjustment mechanism. Behold! 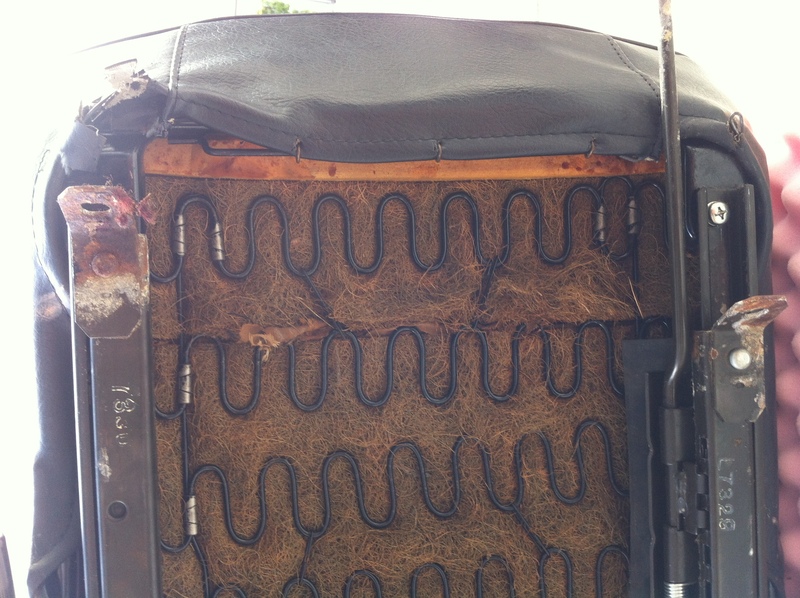 the underside uses that same straw-like padding as seen in the seat backing. I was blocked by these stubborn screws holding down the chair adjustment spring fixture. 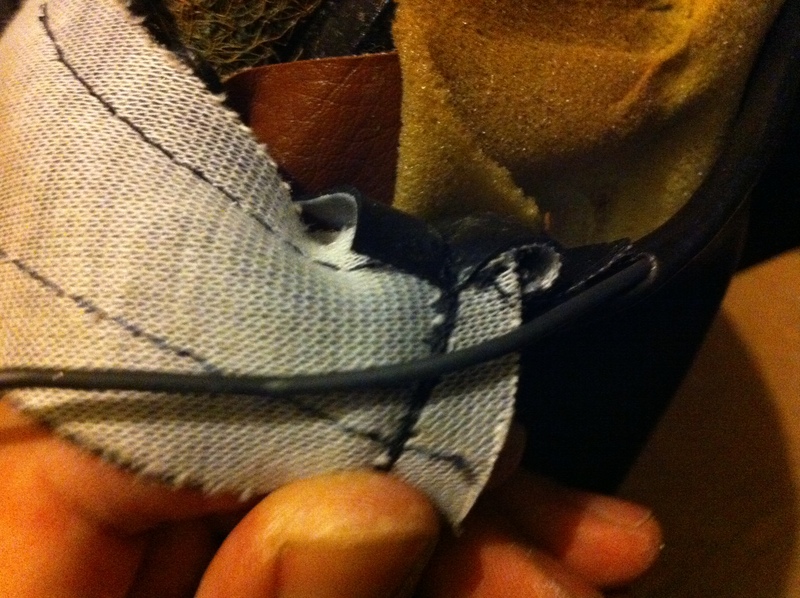 Even with WD-40, corded drill with PH-3 (big) bit, and some taps from a hammer – those tough screws were NOT coming out. So I got a little clever and cut the old vinyl to slide it out from the seat spring fixture. This method will prove VERY useful when putting the new cover on. The original seat foams are from Toyo. A quick part search on google for ‘PM690M9’ reveals nothing – surprise. 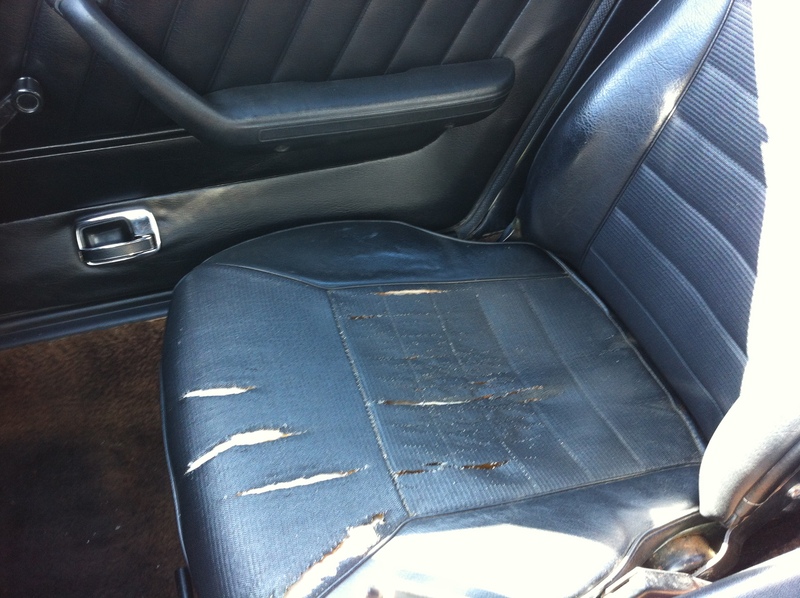 Minor surface rust in the seat spring; only a little clean up required. 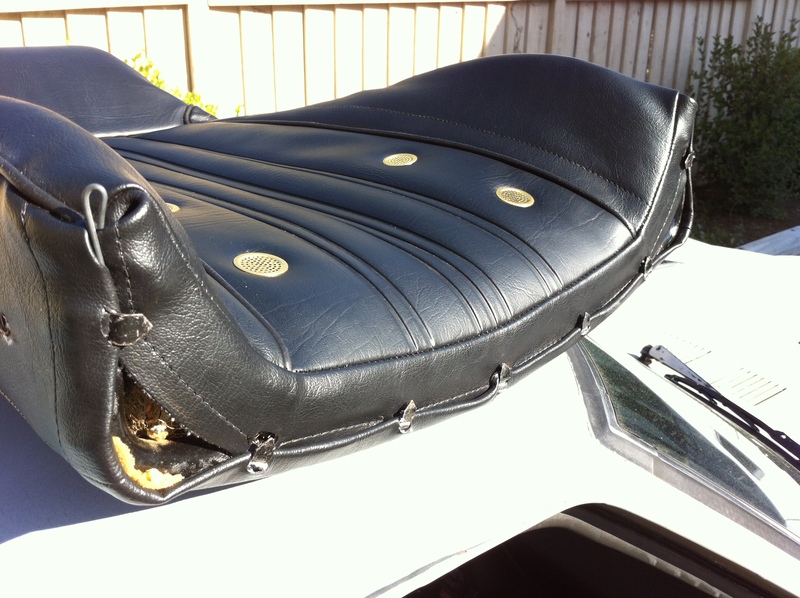 After a quick test fit of the new seat cover, I thought there was a bit too much play in the cover and the seat foam. So i decided to use some extra foam i’d been saving just for this purpose. 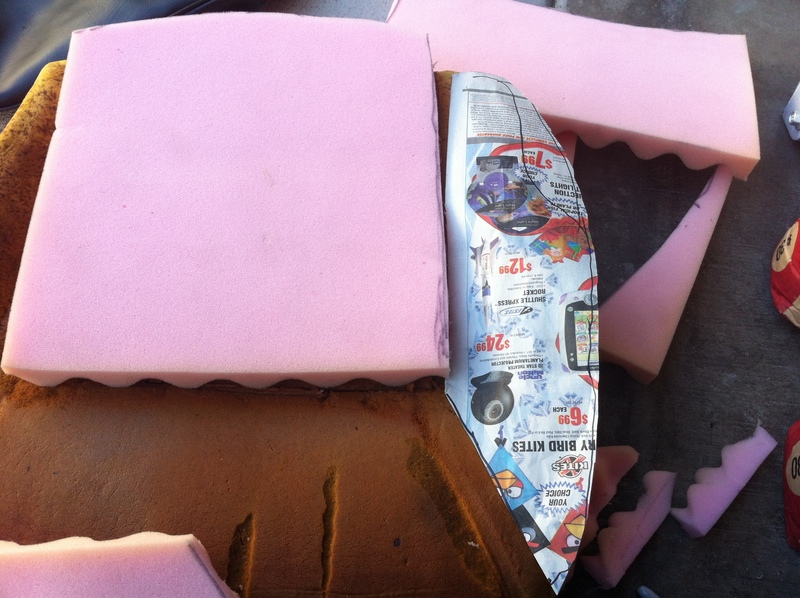 Though pink open celled foam like this isn’t ideal (as it WILL eventually disintegrate), it should last several years before collapsing out, by that time, i’ll just get new foams entirely. 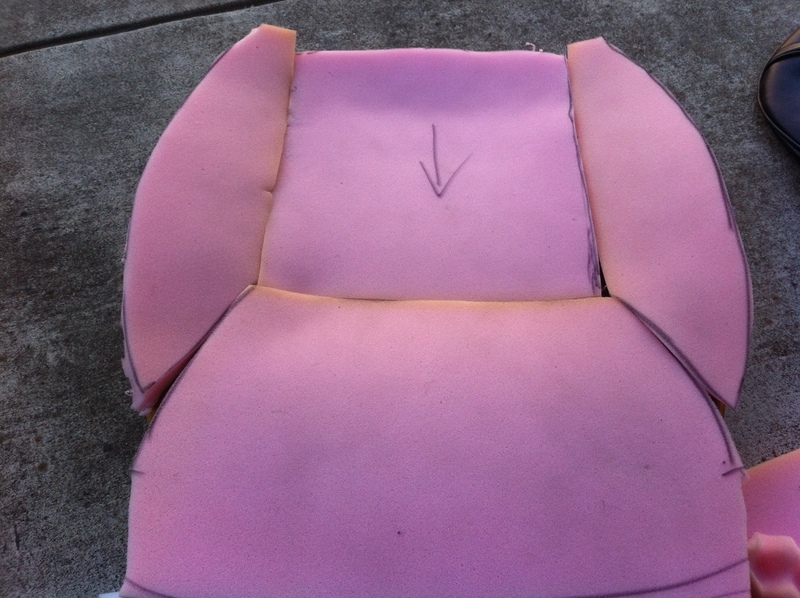 Here, i cut a pattern for the seat bolster because the seat cover is a touch wider than the tapering original seat shape. 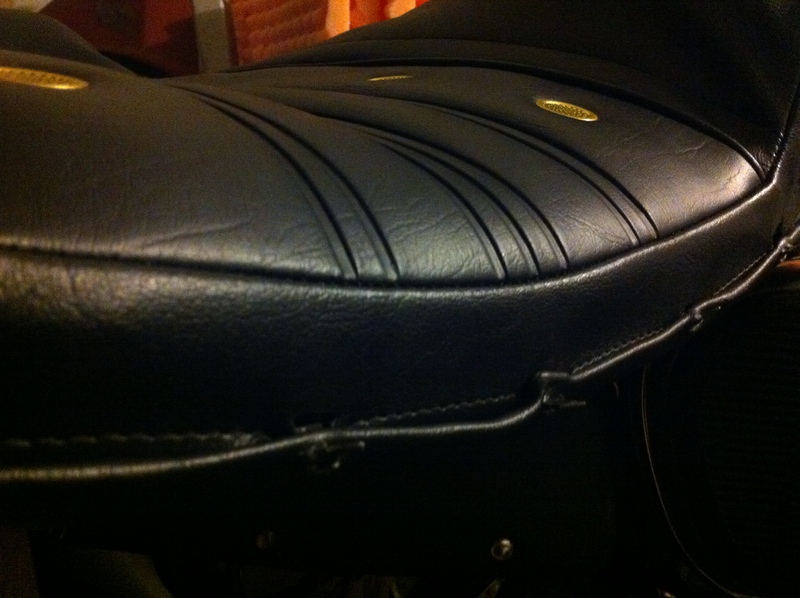 I also decided to replace the straw-like padding on the bottom between the seat foam and the seat spring. 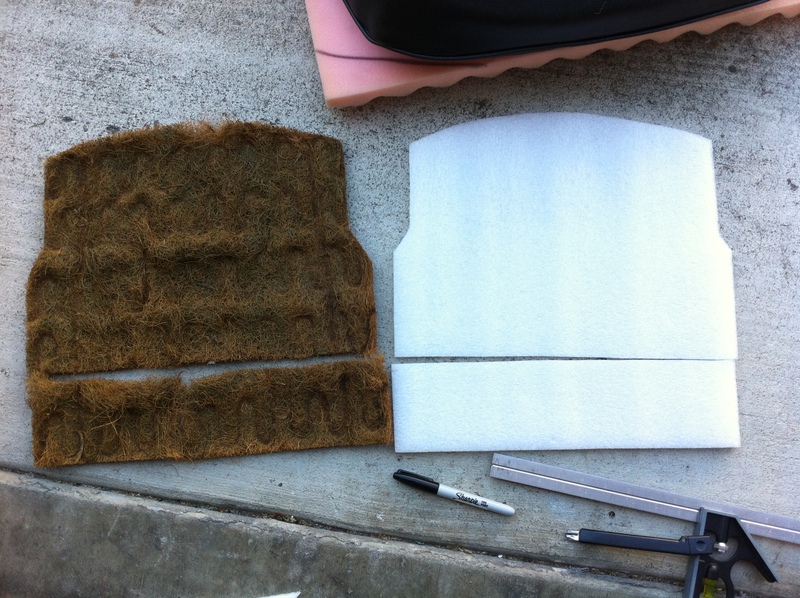 My first thought was it was just a protective layer between metal and foam.. but the other day when working on the driver seat (which had this material and burlap…), i realized it’s other responsibility… absorb any excess moisture. oh well. The new seat covers use a string to cinch the cover to the frame. 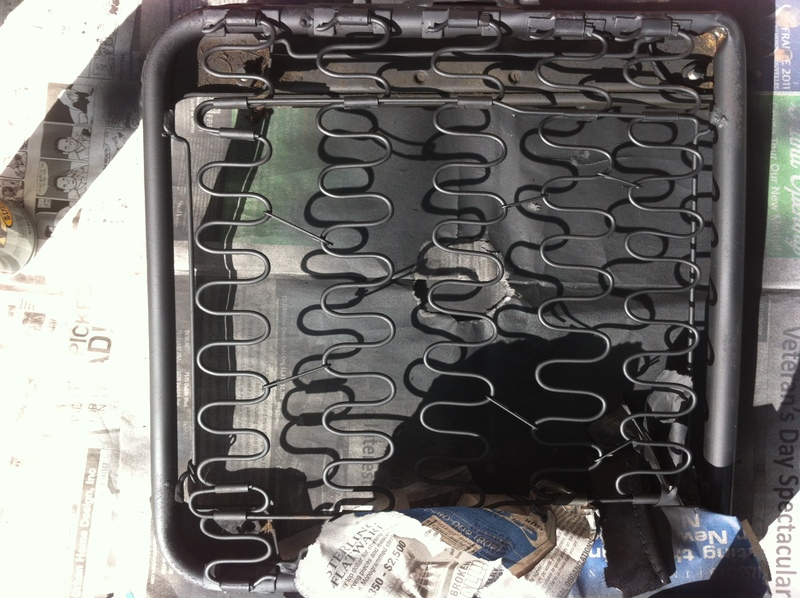 I decided to re-use the hog tie re-bars (as well as the string) to make sure the covers sit firmly in place. 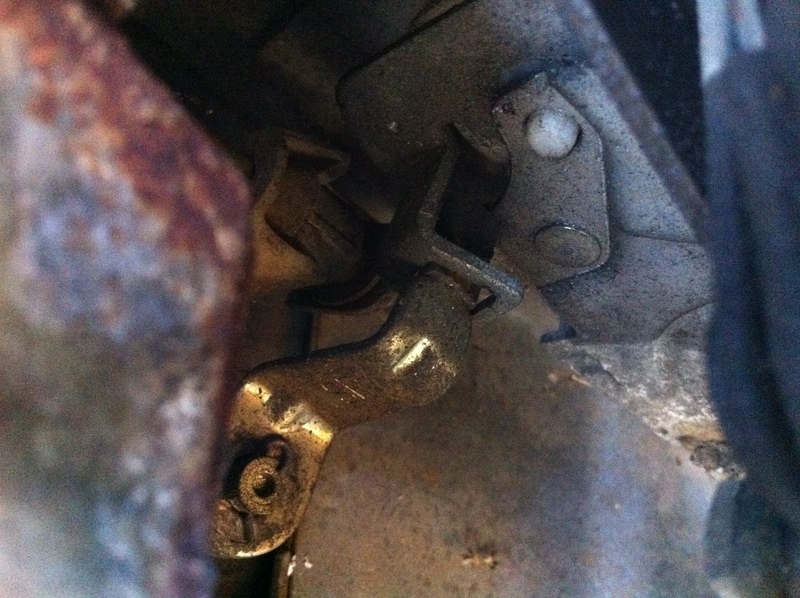 Here, you can see where i cut the new seat cover to fit in between the bolts that hold the spring assembly. 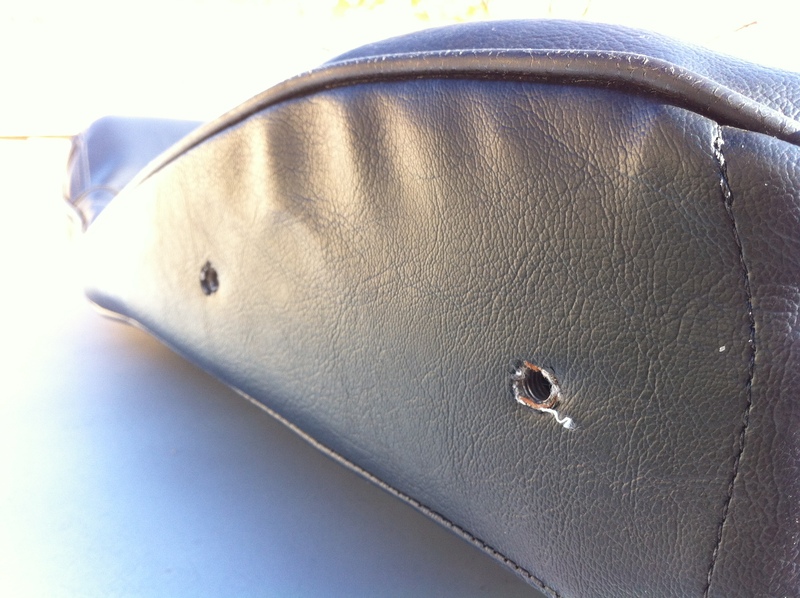 I pulled the string out from that portion of the seat cover, cut, slid the cover through the opening between the bolts, and then fished the string back through. First thing i thought of was that this solution would be something my dad or grandfather would think up of. Worked like a charm, and best of all I can move forward. Seat completed, hog tied tight. Perfect. 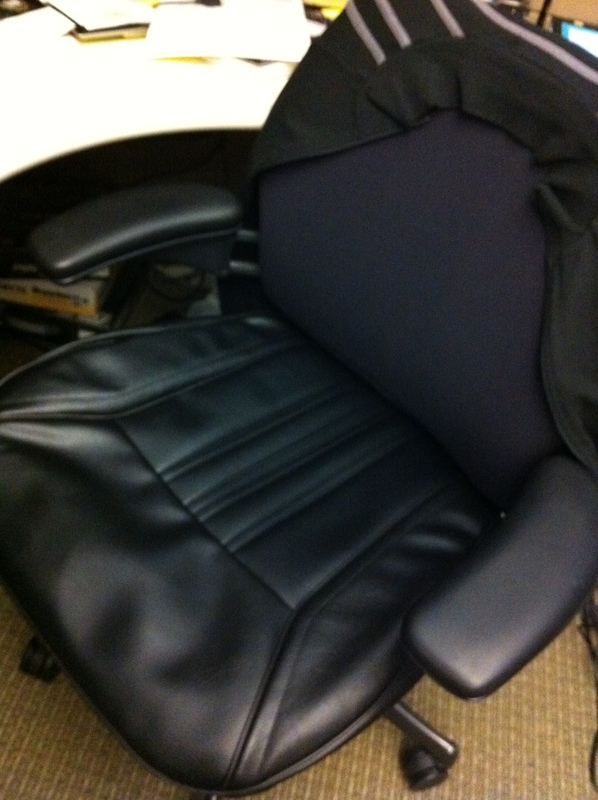 The seat bottom is extra cushy, and it’s got great shape. I lightly sanded down the bolts, sprayed the seat back bracket with bed liner for a nice rough texture, and cleaned / sprayed the slider lever. 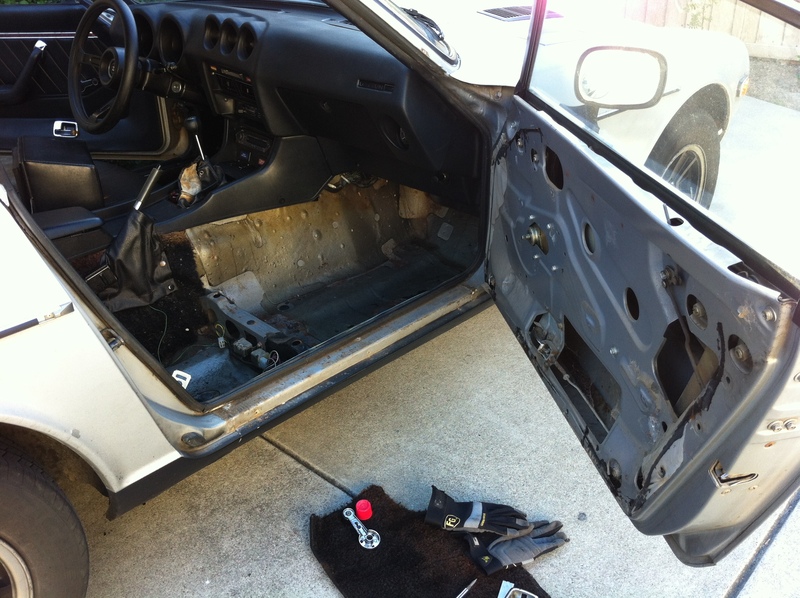 Finally got around to covering the other seat back on the 280z this past weekend – Kris was down to help me out. the driver side is padded! 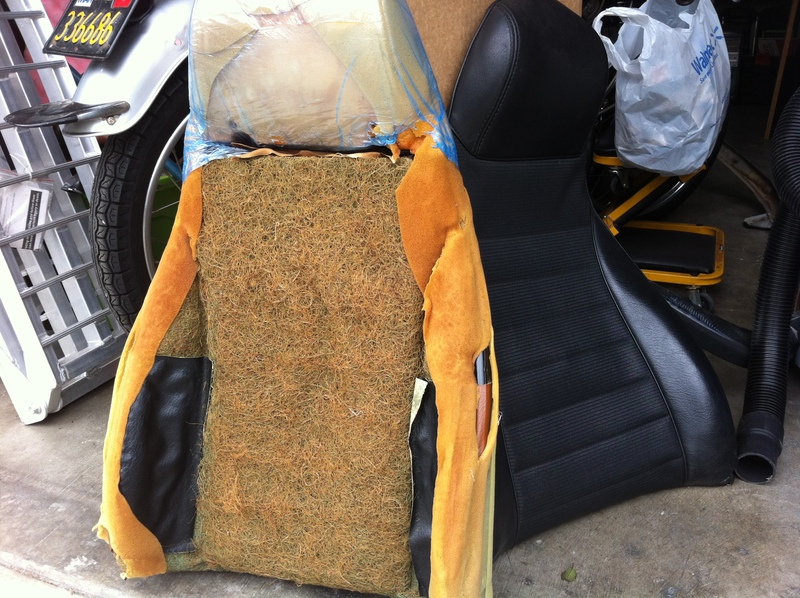 an additional layer of foam covers the hairy jute-like seat cushion. Here’s Kris setting the hog rings, getting them in place. 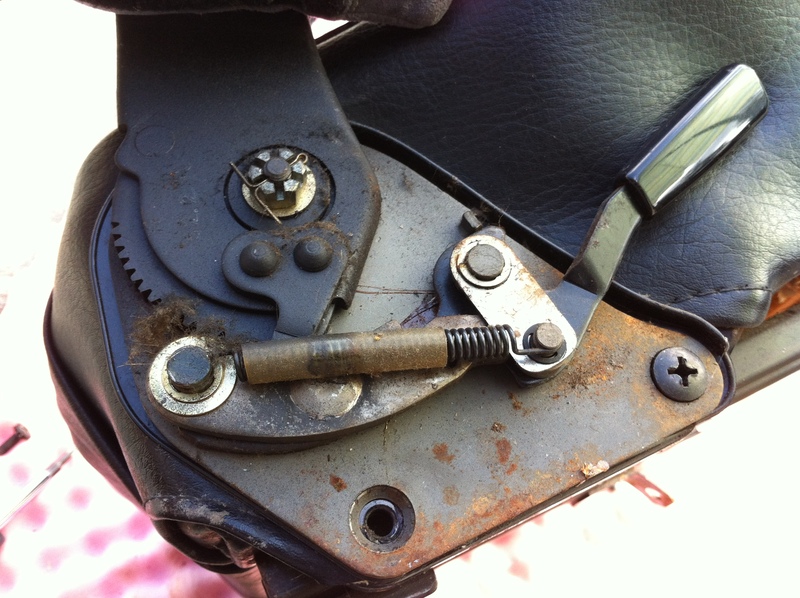 Again, honestly, you don’t to worry about getting hog ring pliers – we used them for a whole two seconds for a job that could’ve been done using regular pliers. 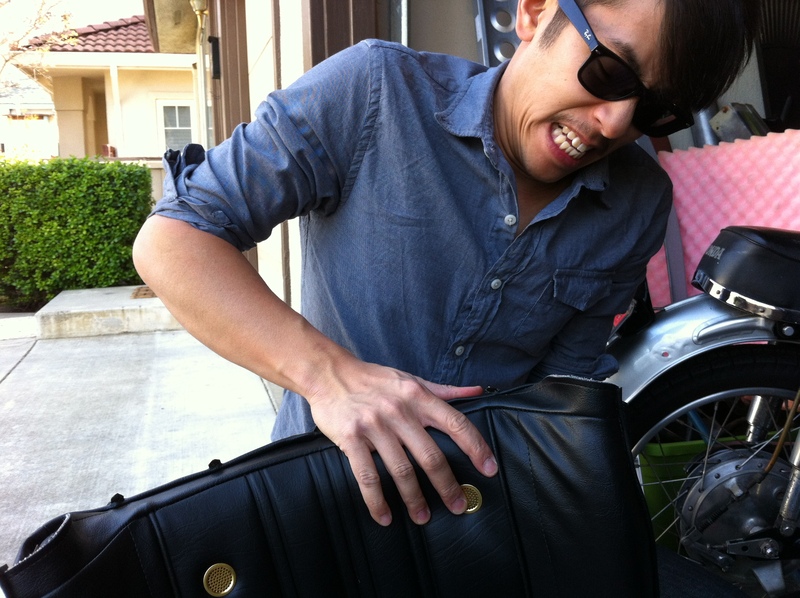 Stretching a seat cover can be difficult work. It was a fairly warm day, so we were working with optimal conditions. Really, it’s the seat pattern that was just a touch too short for the liking. But pulling, stretching and team work prevailed. Tucked and pierced the n0n-barred flap under the barred flap, just like last time. Now to get those seat bottoms done and the 280z will start to look good. 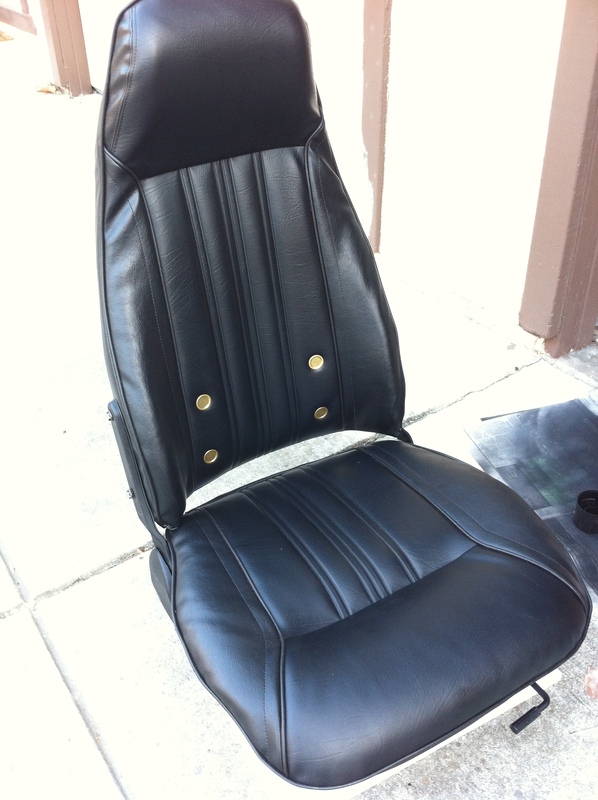 I finally found some time this morning and re-upholstered the seat back…yes, just the back. Previously I purchased 1976 styled 280z seat covers for my 1977 (my year had the plastic “basketweave” styled backrest, ugh), and now it’s time to put them on. And I’ve got to say, my forearms burn like i just went rock climbing! Here’s some of my feedback on the process. If you’re looking at recovering you’re own seats, here’s what I did, and it may help you. 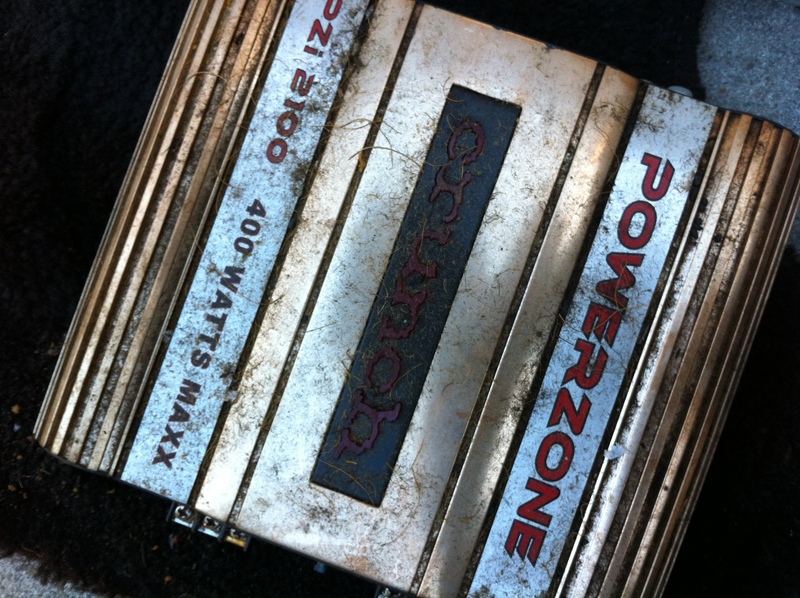 1) Take off of the old covers – I paid special attention to how the old covers were put on, and it made a difference. 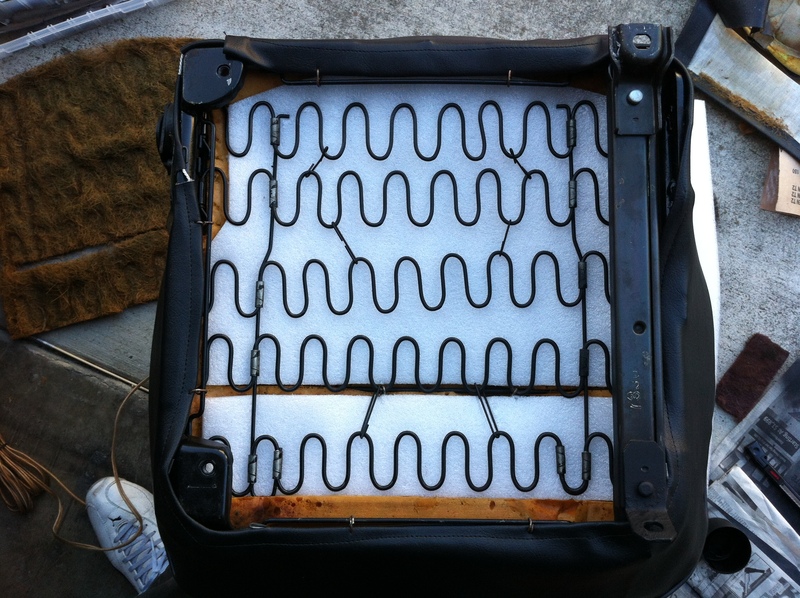 My 1977 280z “basketweave” seat covers were held down by metal prongs / tangs, and two sets of metal rods for reinforcement. The front face of the seat cover is under the back face. And the prongs pierce through the vinyl. What was interesting was this seat arm “pocket” on a single side of the seats – none of them had been used! The arms were attached on top of the pockets instead of inside of them (though the original fit looks intentional). 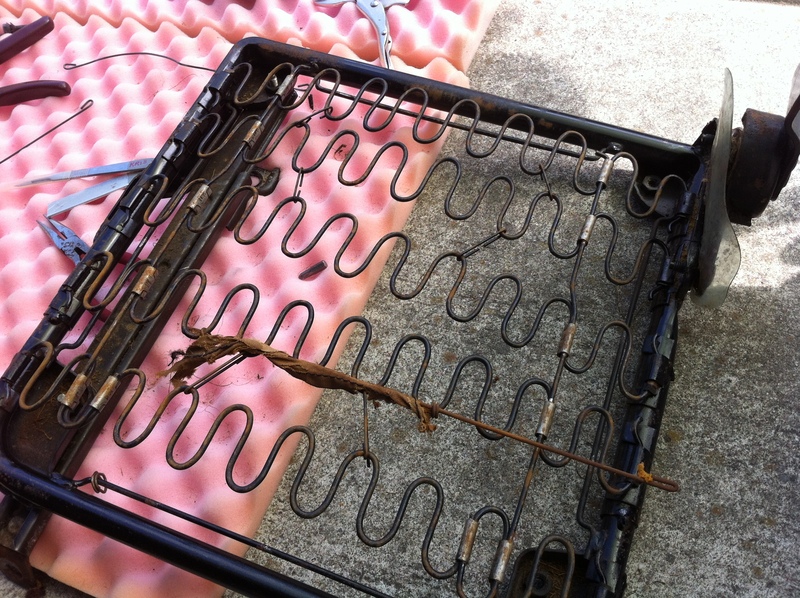 There were metal reinforcement rods along the edges that will need to be removed and reused for the new seat covers. Always remember to label just in case! Like taking off a shirt, there’s two ways of taking off an old seat cover: 1) starting from the headrest, 2) starting from the bottom and rolling up. 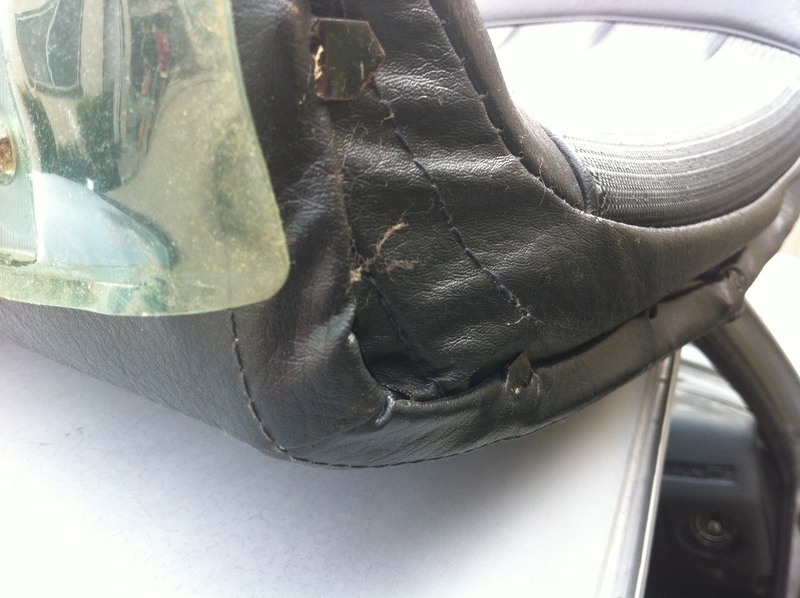 There is a flap of extra material that hold down the seat cover snug to the seat between the headrest and the back. 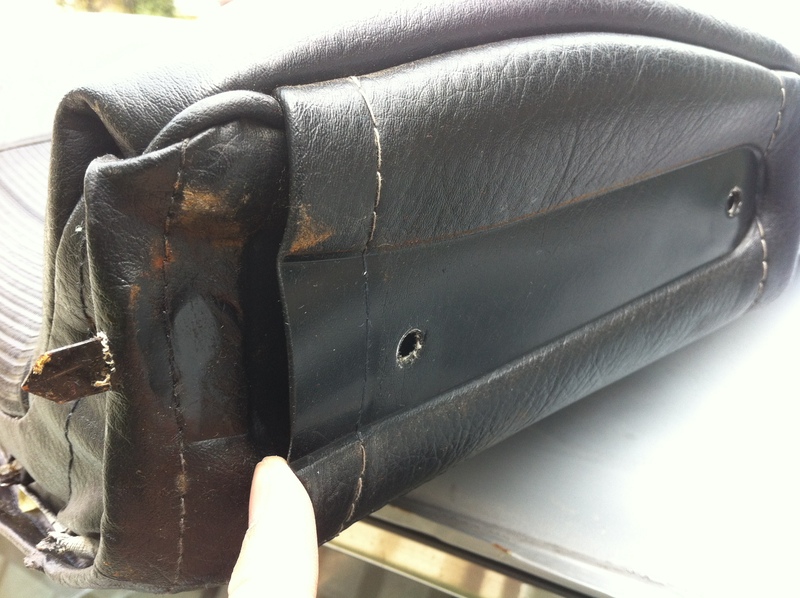 If this flap has disintegrated like mine has, then you can just shimmy off the old cover like a shirt (method 1). If the flap is still intact, then you’ll have to roll up the cover from the bottom (method 2), undo the hog rings, and then take off the cover. 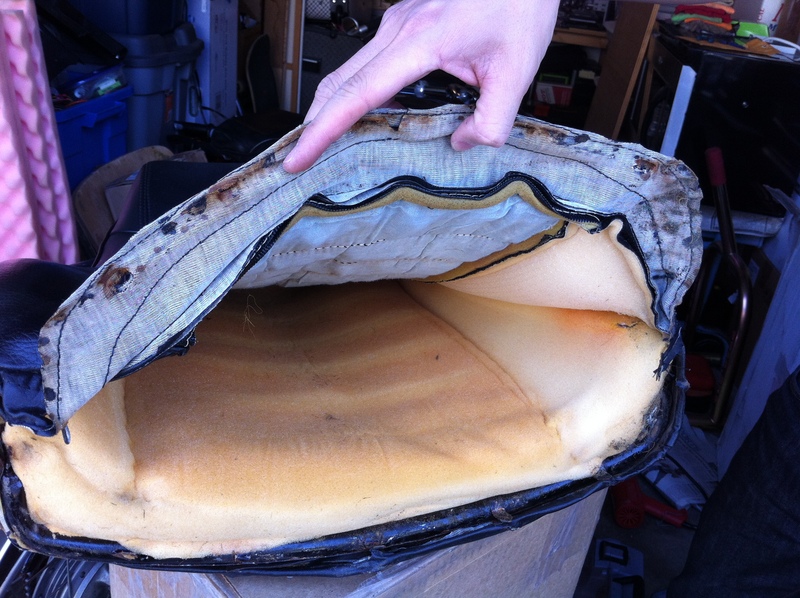 Very surprising – the back wasn’t foam material at all! 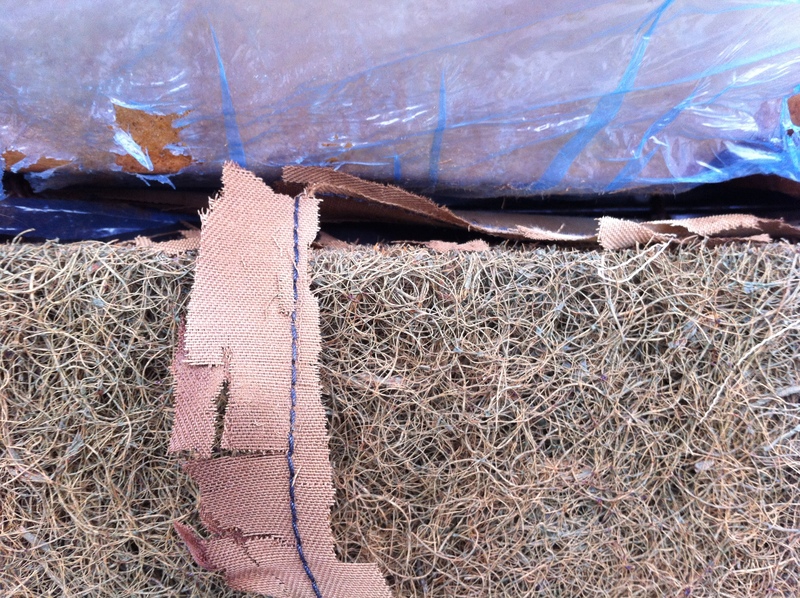 The seat back padding is this straw-like material that is semi-dense and springy. With the vinyl, i’m sure it’s provides a good amount of breathing for the back. 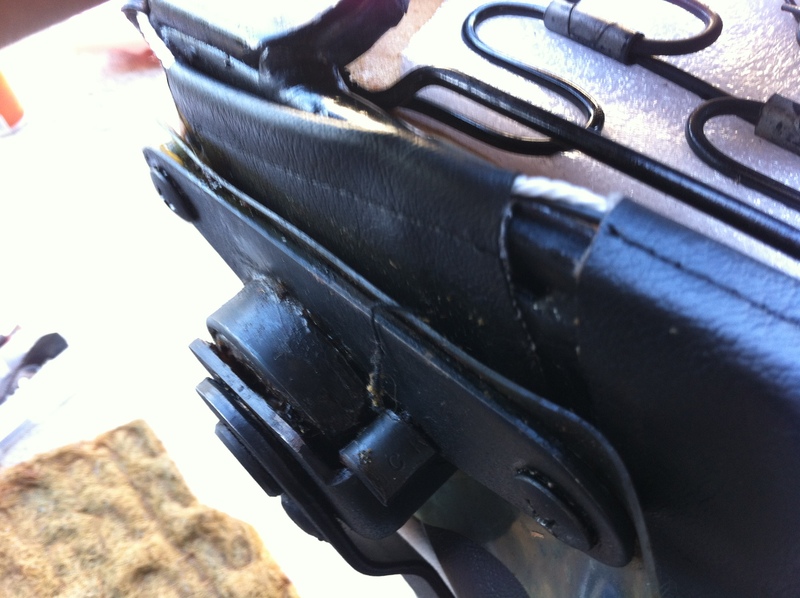 You can also see the disintegrated cotton flap that previously help hold the seat cover taught. 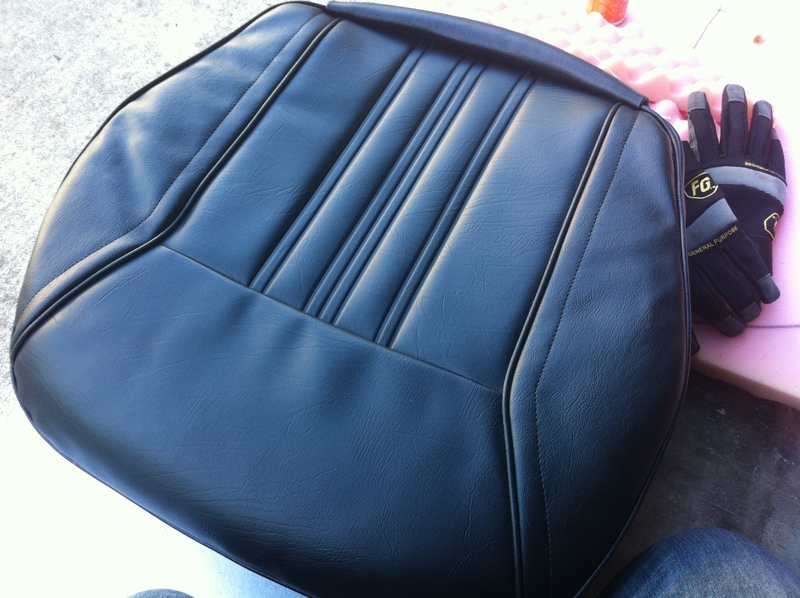 The new 1976 seat covers have vinyl flaps to hold the material down. On to the new seat cover! 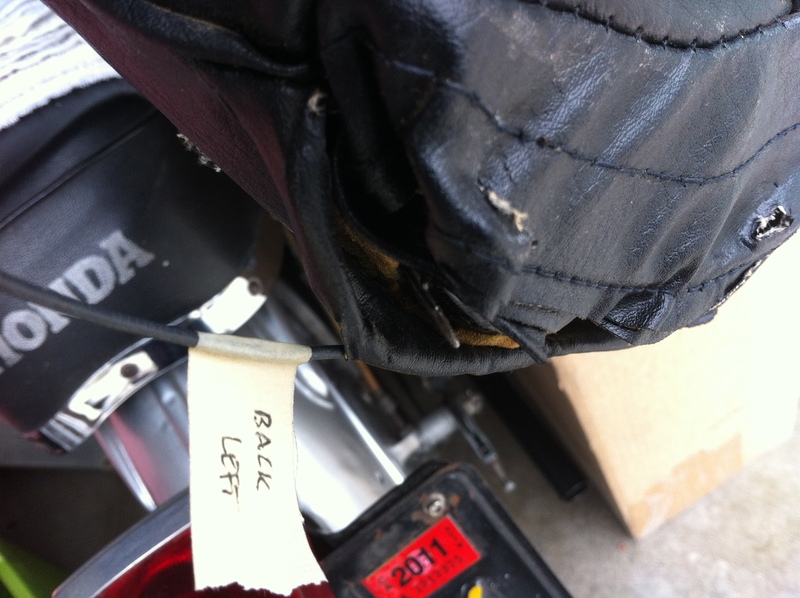 Here you can see the flap that lays between the headrest and seat back, and the hog rings that keep it there. 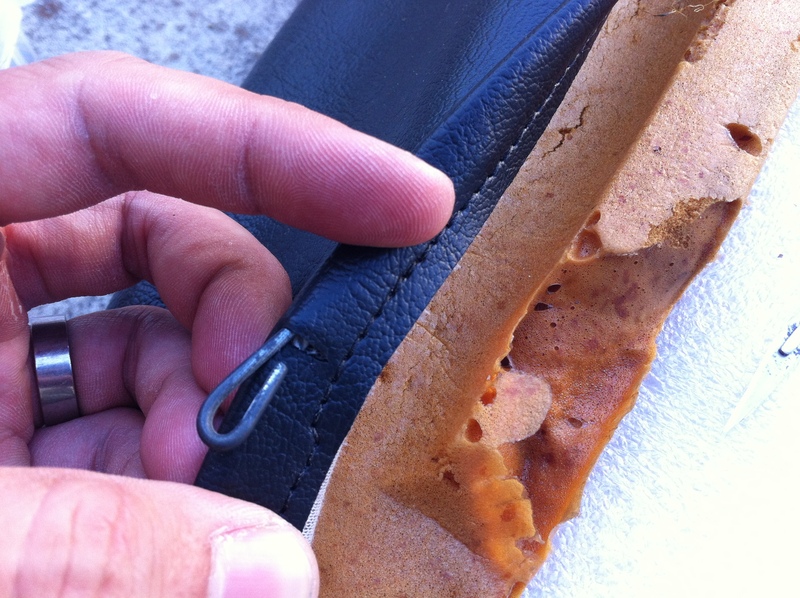 There’s also a metal rod through the flap to help reinforcement it. I ended up getting new hog rings at home depot (chain link fencing aisle), as well as hog ring pliers. HOG RING PLIERS AREN’T REALLY NECESSARY. It takes a touch of finesse, but I was able to manage with just needle nose pliers. “Put the cover on like a condom”. That’s actually pro advice from a friend who used to work summers at this father’s upholstery shop. And he was right. Invert the cover first. 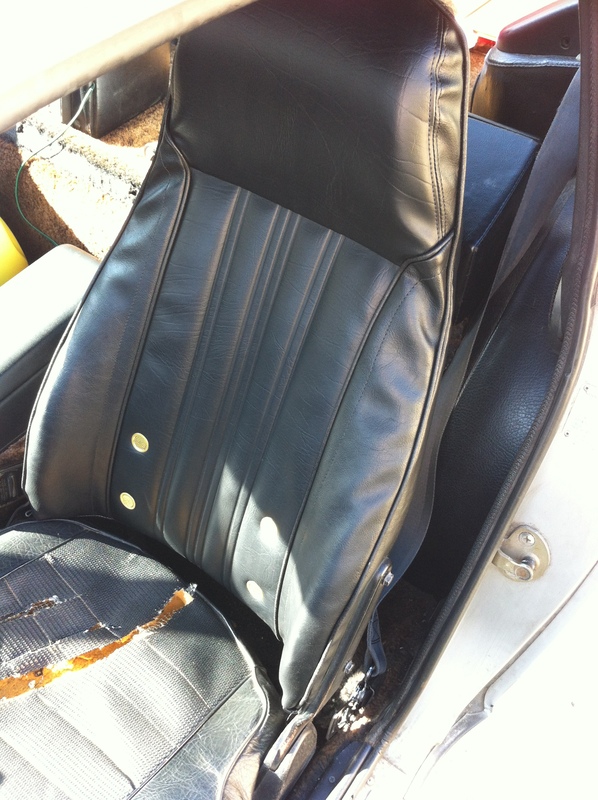 Then starting with the headrest put the cover on, rolling back on the rest of the cover on to the seat. When you get to flap between the headrest and the back, hog ring it down to the metal rod that’s between the two paddings. And continue to roll down. 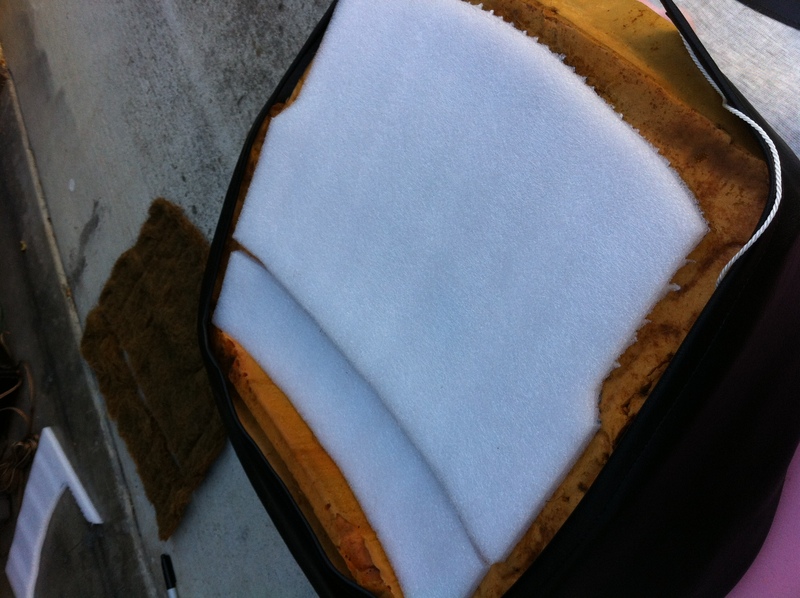 Putting on seat covers work best when the vinyl is warm. 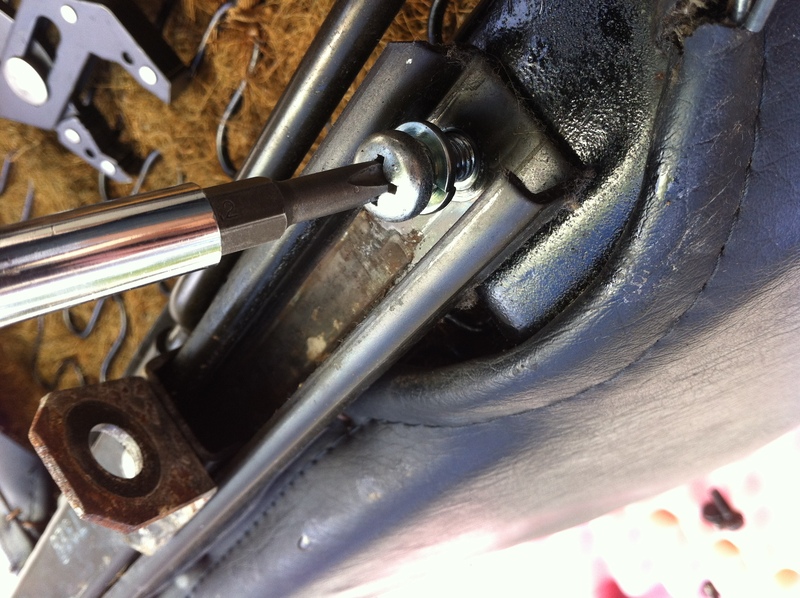 Inserting the metal rod at the end of the seat cover. 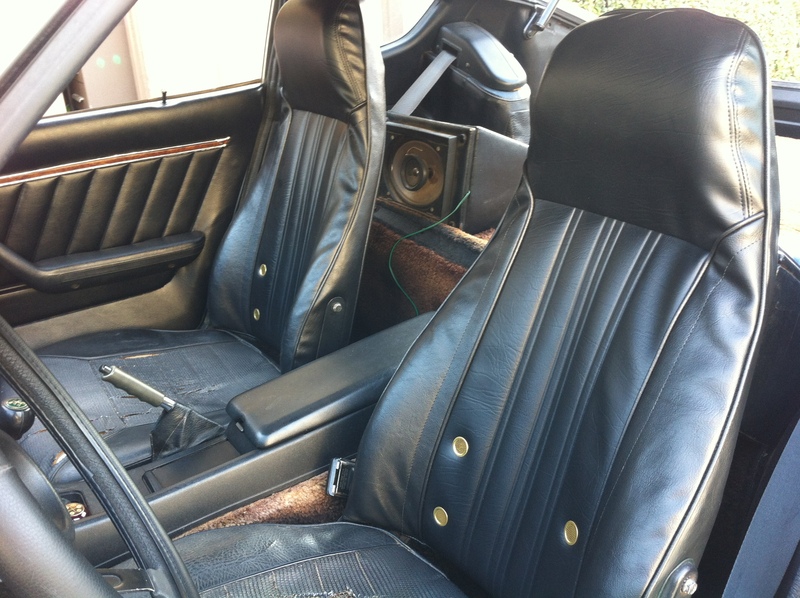 Work the vinyl downwards starting from the headrest on down to the bottom – almost like massaging it down. 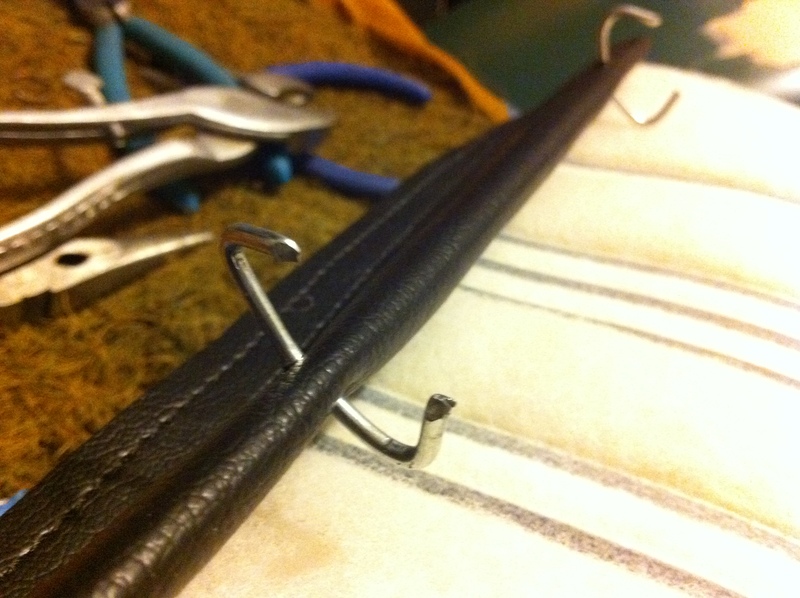 This will really help you be able to pull the covers tight, and get the ends around the prongs. Cut holes for the seat arms. 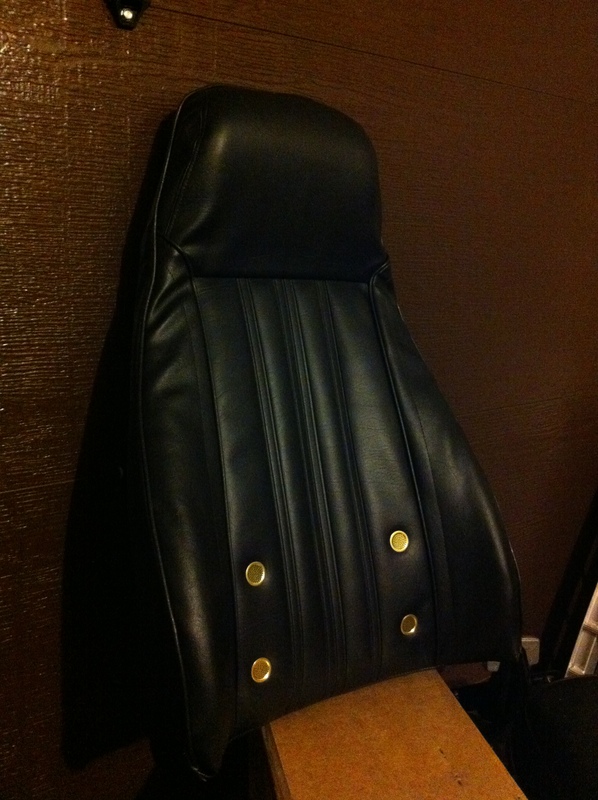 Seat re-covering takes quite a lot of patience and arm muscle – but certainly more of the first. You need to be patient and work the vinyl from the top down, continuously. 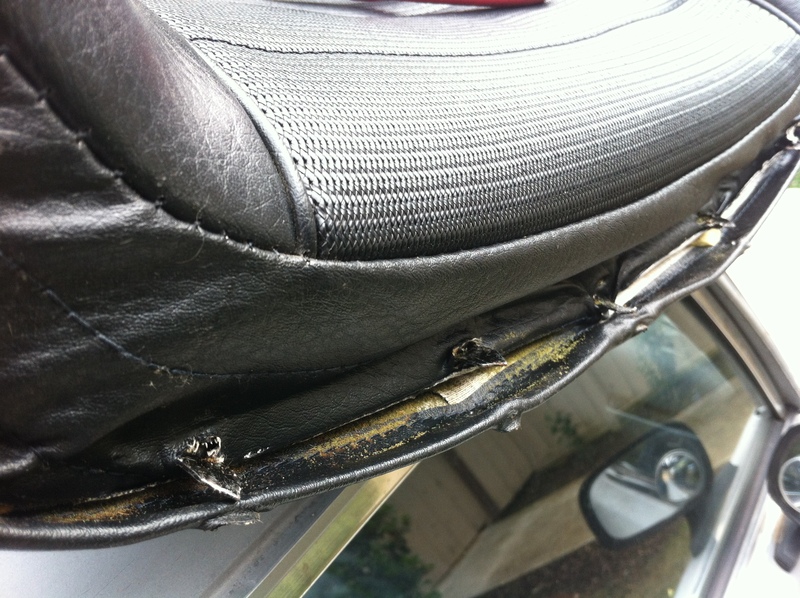 This will help with the fit, and certainly when you need to secure the seat cover ends to the seat back frame / prongs. 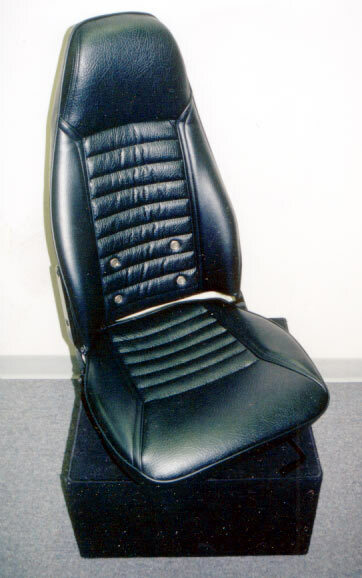 Additionally, i should probably re-do this one after the passenger seat gets done – there’s excesses material in the upper bolsters that should be mounted down and lie flat on the chair. To do this, my friend suggested that i use spray glue / mounting adhesive. I’m sure this technique will require some practice to be good at it, as drying time, and allowing for stretch are major factors. 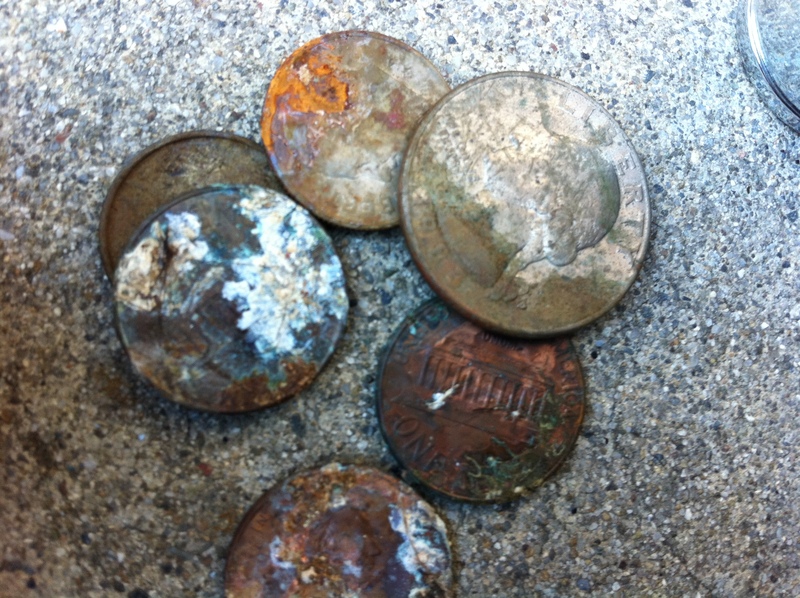 I wish I could pass down where these came from, but the previous owner can’t remember where / whom he’d bought them from. I’d give them about an 8/10 – good quality, decent fit (could be a touch better). 1.5 seats more to go. gonna be a fun weekend. Looks like a cat got to it as normal tearing would’ve probably gone width-wise. These original seats for the late Datsun 280z are called ‘Basketweave” and replacement covers sell for about $299 on BlackDragon Auto. Yikes. Initially I wanted the 240z version with the horizonal “jelly rolls”(as i like to call them). They just scream, ‘classic’. 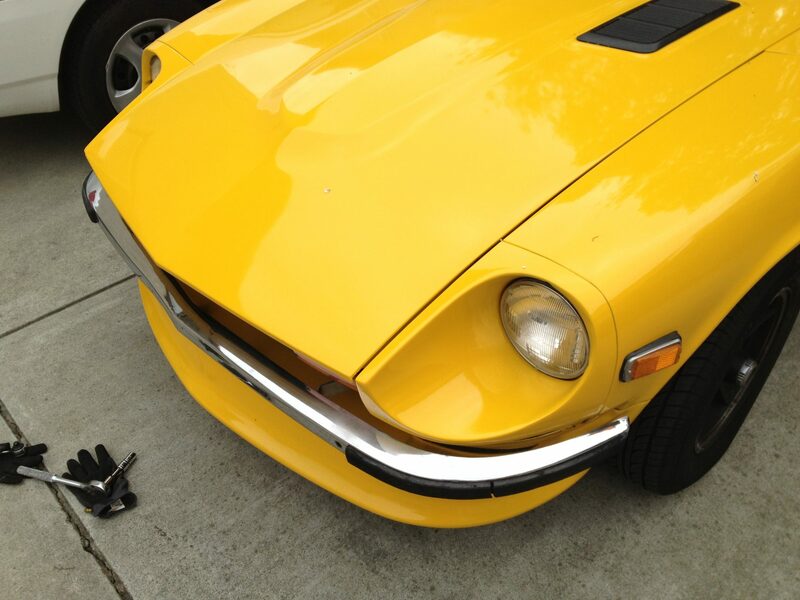 But even those are $200/piece (w/ replacement foam) from Les at Classic Datsun Motorsports – and sad to say, after two emails and almost a week later for a price quote, I haven’t heard back from them. In the end, I guess it has worked out. 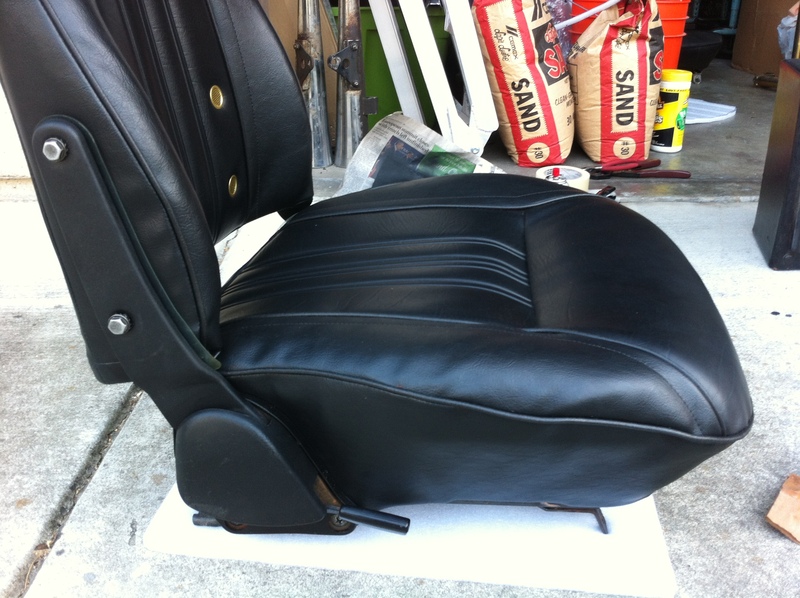 I just picked up some great looking ’76 seats covers from Mark D over from the All Datsun Classifieds / ClassicZCar forums. He was selling them for a great deal: $150, and I’ll reuse my current foam. Although they’re not my first pic, the look has really grown on me. Can’t beat that they were at a great price… and they have the vent holes. love those. When then come in, i’ll be sure to post how I’ll put them on, and perhaps make a helpful video for it.